The modern color scheme of the Remi collection by Croscill will refresh and modernize your space instantly. The silver damask pattern stands out nicely against the dark charcoal gray for the background. A simple pleated bedskirt adds dimension to the room without taking away from the eye-catching comforter set. This ensemble features a simple diamond jacquard that carries to the drapery panels, European shams, and the boudoir pillow. Layer the circle valances on your window for a fuller look, or mix them with the drapery panels for an elegant window. A contrasting floral accent pillow catches your eye and flows beautifully with the rest of the set. Croscill uses their amazing attention to detail with covered button accents and simple cording to finish off the pieces in this collection. Croscill has been a manufacturer of high quality bedding at affordable prices for more than 50 years! The Remi Bedding Collection features a refreshing silver damask jacquard on a dark gray ground. Both the comforter and pillow shams are trimmed with a covered cord. The simple pleated Bedskirt features a solid textured fabric adding that perfect finishing touch! One (1) Queen Comforter, two (2) Standard Shams, one (1) Bedskirt 15in drop, Comforter measures 92x96, polyester fabric and poly fiber fill, dry clean recommended, imported. Manufactured by Croscill. The Remi Bedding Collection features a refreshing silver damask jacquard on a dark gray ground. Both the comforter and pillow shams are trimmed with a covered cord. The simple pleated Bedskirt features a solid textured fabric adding that perfect finishing touch! One (1) Cal King Comforter, two (2) Standard Shams, one (1) Bedskirt 15in drop, Comforter measures 110x96, polyester fabric and poly fiber fill, dry clean recommended, imported. Manufactured by Croscill. 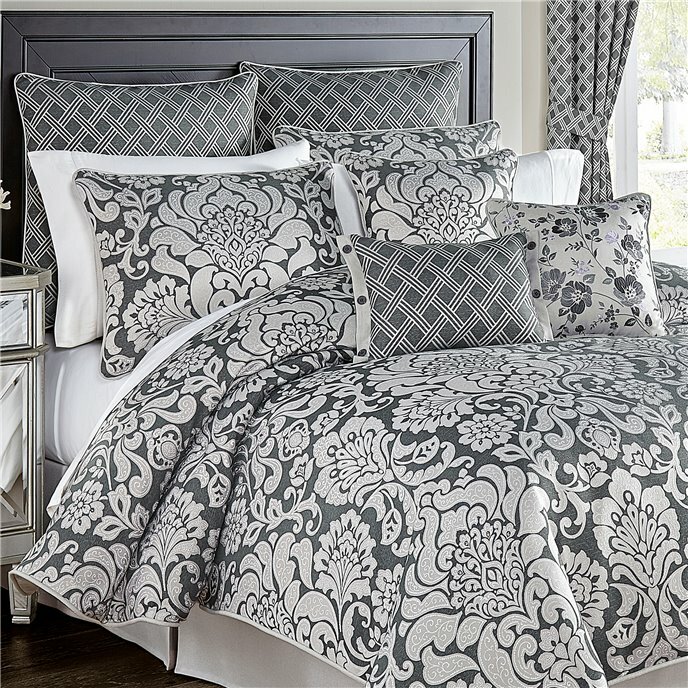 The Remi Bedding Collection features a refreshing silver damask jacquard on a dark gray ground. Both the comforter and pillow shams are trimmed with a covered cord. The simple pleated Bedskirt features a solid textured fabric adding that perfect finishing touch! One (1) King Comforter, two (2) Standard Shams, one (1) Bedskirt 15in drop, Comforter measures 110x96, polyester fabric and poly fiber fill, dry clean recommended, imported. Manufactured by Croscill. The Remi European Sham features an eye-catching diamond jacquard. This sham is trimmed with a simple covered cord and reverses to a beautiful solid textured fabric. One (1) European Sham, Measures 26x26, polyester fabric, dry clean recommended, imported. Manufactured by Croscill. The Remi 18” x 18” Basic Square Pillow features a refreshing silver damask jacquard on a dark gray ground. This pillow reverses to a beautiful solid textured fabric and is trimmed with a simple covered cord. One (1) Square Pillow, Measures 18x18, polyester fabric and poly fiber fill, spot clean recommended, imported. Manufactured by Croscill. The Remi 19” x 13” Boudoir Pillow features an eye-catching diamond jacquard with a lovely solid textured fabric flange and charming button detailing. This pillow reverses to the solid textured fabric. One (1) Boudoir Pillow, Measures 19x13, Polyester and poly fiber fill, spot clean recommended, imported. Manufactured by Croscill. The Remi 16” x 16” Fashion Pillow features an impressive floral embroidery on a solid textured fabric. This pillow reverses to a beautiful solid textured fabric and is trimmed with a simple covered cord. One (1) Fashion Pillow, Measures 16x16, polyester fabric and poly fiber fill, spot clean recommended, imported. Manufactured by Croscill. The Remi Circle Valance features a refreshing silver damask jacquard on a dark gray ground and is finished with a lovely covered button. One (1) Valance, Measures 42x24, polyester fabric, dry clean recommended, imported. Manufactured by Croscill. The Remi Curtain Panel Pair features an eye-catching diamond jacquard with matching tiebacks. Each panel is lined with a solid white polyester lining and include encased weights in the bottom hem. Two (2) Window Panels, two (2) Tiebacks, Measures 82x84, polyester fabric, dry clean recommended, imported. (2nd image shows with valance sold separately.) Manufactured by Croscill. The Remi Curtain Panel Pair features an eye-catching diamond jacquard with matching tiebacks. Each panel is lined with a solid white polyester lining and include encased weights in the bottom hem. Two (2) Window Panels, two (2) Tiebacks, Measures 82x95, polyester fabric, dry clean recommended, imported. (2nd image shows with valance sold separately.) Manufactured by Croscill.